“I’m Gonna Wash My Hands of You.” Words by Eddie Pola, with music by Franz Vienna (a.k.a. Franz Steininger). Recorded by Ambrose and His Orchestra, with vocal chorus by Sam Browne and Elsie Carlisle on November 20, 1934. Decca F. 5318 mx. GB6777-1. 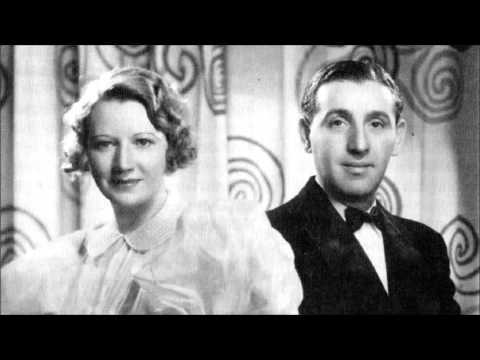 This foxtrot of vituperation is particularly suited to Sam Browne and Elsie Carlisle, who had convincingly played the part of the bickering couple in “Seven Years With the Wrong Woman” in 1932. “I’m Gonna Wash My Hands of You” has lyrics by Eddie Pola, who co-wrote other songs that Elsie recorded, such as “My Canary Has Circles Under His Eyes,” “I Wish I Knew a Bigger Word Than Love,” and “Till the Lights of London Shine Again.” As the flip side to “No! No! A Thousand Times No!” “I’m Gonna Wash My Hands of You” is a suitably dramatic complement. It involves somewhat more genuine singing and somewhat less booming, mock-thespian declamation; moreover, it includes more opportunities for the instrumental excellence of Ambrose’s band to be heard. For this author, however, the high point of the song is when Elsie sings “You cheat, you! I wish you were a gong so I could beat you!” and Sam replies “You wanna beat me, huh?” This song’s excellence lies in its fundamental goofiness. Nat Gonella made a particularly “hot” recording of “I’m Gonna Wash My Hands of You” in January 1935, and Billy Cotton followed suit the following month (with Teddy Foster as vocalist). The French group “Patrick et son orchestre de danse” (directed by Guy Paquinet, with Django Reinhardt on the guitar) turned out a pretty version in June 1935, with suitably sinister-sounding vocals by Maurice Chaillou. That year Pathé released a film short of “The Radio Three,” a female close-harmony group made up of Joy Worth, Kay Cavendish, and Ann Canning, singing a version of “I’m Gonna Wash My Hands of You” that recalls the style of the Boswell sisters.